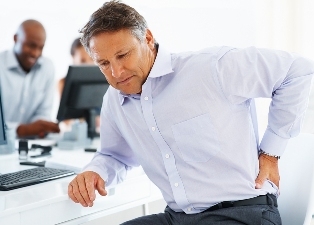 Low back pain is a common and debilitating condition that is the single leading cause for disability worldwide. Half of all working Americans experience chronic back pain symptoms each year, making it one of the most common causes for missed work. The majority of back pain cases are caused by mechanical problems, such as a herniated disc, rather than a serious condition. If your back pain is triggered by a spinal misalignment, chiropractic care can help. Chiropractic care treats the root cause for back pain, restoring proper spinal alignment for reduced pain and improved mobility. Spinal misalignments, such as herniated discs or slipped discs, are a common cause for back pain. If a herniated disc, for example, compresses the lumbar spine, this can trigger a radiating pain sensation along the length of the compressed nerves. As long as this spinal compression persists, patients will continue to experience pain. While medication can provide some pain relief, once drugs wear off pain will return. This is because medication only numbs the brain’s ability to perceive pain; drugs do not actually treat the pain. Chiropractic care is an effective, drug-free treatment option for addressing the root cause of your pain. Chiropractic adjustments are designed to bring proper alignment back to the spine, alleviating compression. In addition to providing natural pain relief, Dr. Bonde, who is one of Birmingham's natural wellness physicians, works closely with each patient to help reduce the risk for future pain and health problems. This includes helping patients safely resume an active lifestyle following an injury, since prolonged inactivity and bed rest are leading causes for back pain. Our chiropractor can teach you corrective care exercises to safely resume activity, along with warm-up and other stretching exercises to limit the risk for future back pain and support a healthy range of motion. Poor posture is also a leading cause for back pain. Leaning forward or hunching over to view a computer screen or even slumping on the couch while watching TV can compress the lumbar spine. A lack of support while sleeping at night can also affect posture. Sleeping on a mattress of medium to strong firmness is optimal for proper spinal support and minimizing the curvature of the spine. Core strengthening exercises are beneficial for building a strong core support, which is essential to maintaining proper spinal alignment. Our chiropractor may make ergonomic recommendations, such as adjusting the height of your office chair, for natural pain relief and improved posture. If you are suffering from chronic back pain, the good news is that chiropractic care is a safe, effective alternative to medication and surgery. Chiropractic adjustments can also help individuals who are suffering chronic pain following failed back surgery. Dr. Bonde has had significant success with natural pain relief for both neck and back pain, and we can help you achieve long-lasting relief! To learn more about the benefits of chiropractic care for back pain relief, contact our Birmingham chiropractor today at (248) 645-6070.